Yes, the row boat that brought mine over must have had a shipment for Amazon too. Haha. Mine took one month from date of order to delivery. That's ridiculous, lol. At least Prime takes 2 days max. I still haven't received mine from EasyGuard . Pretty sure UPS lost it . 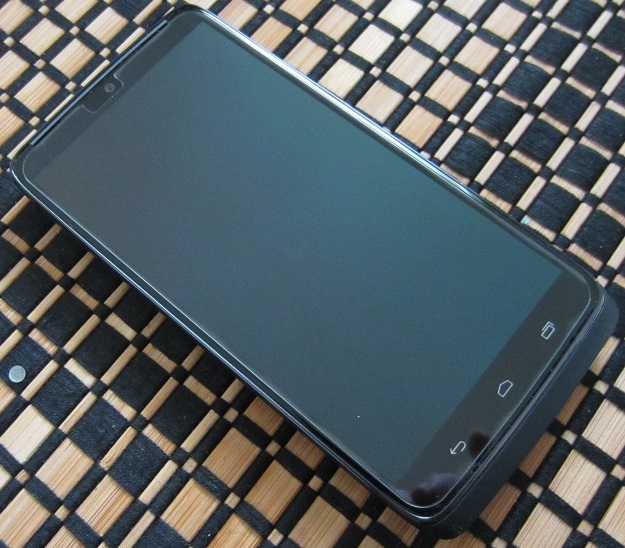 I installed the Extreme Guard tempered glass and removed it immediately. The Halo was all over the edges and I had it centered perfectly. Going to request a refund. I will have my iVoler tomorrow so here's to hoping its great. This item is CRAP! DON'T buy one! Extreme Guard has issued me a full refund. Yea I typed the wrong one . It was the glass one . Had it on the phone for about a half hour . It didn't sit flat in the upper left corner . My extreme guard is still working just fine. The only haloing is below and between the capacitive buttons. In a couple months when there is a wider selection I will go back, research it, and spend enough to get something that will perform and last for two years. The cheap one is just fine as a stop gap. This morning, I finally got around to installing mine (replacing the VZW which I was not too happy with and cost 3x more). Fitment was far better than the VZW. Perfect adhesion and positioning on the very first application attempt, and daaaang, that thing is way thicker than the VZW. Makes me feel like my phone is practically armored. I find it interesting that we are getting such a wide variety of user experiences with this product, with a lot of folks being very displeased, and also many being perfectly happy with it. I am happy to fall into the latter category. For those wondering how bad XtremeGuardz is I applied it just to show. I turned Flash off because it blocked the excessive Halo. All the off coloring is haloing! I have an iVoler but I had an extra Extreme lying around so I put it on my friends to show you all. The halo on bottom, which isn't shown due to light, goes from the bottom to the bottom of glass to just below space bar on Google Keyboard. My Extreme was no where near that bad. No idea, I have it perfectly centered and zero dust. No reason for this to happen. Yeah, mine is almost perfect, and I love that the edges are rounded so that you don't feel a sharpness when passing your fingers along the sides. My money was far better spent on it than the VZW version. It's definitely a case-by-case thing. I don't know anything about this product or company, but here's a Tempered Glass Screen Protector for 90% off with Promo Code CM90OFF. $59.99 original price was $6 even with free shipping for me. I assume this is a Cyber Monday sale, so if you're interested, I'd suggest going ahead and getting it today. I mean, 6 bucks? I hope it's worth the original price, and not the sale price, lol. I have a strange feeling that these protectors are not all made equal. I installed two iVoler (.2 mm) on my friends phones and even though it was a perfect install the Halo was much worse on all sides than mine. Seeing as you're saying Extreme has done well for you its the only thing I can think of. That's my assessment as well., for what it's worth. A shame, really. Doesn't make me feel any more confident in replacing one and wasting $13. Plus, you can't really recommend any current version without reservations, since everyone's experience is different. I'm not sure what causes this. It appears the size of the 3 iVolers I've had experience with are the same. Does the adhesive not stick as well on some? Maybe, not sure though. Either way, not many options for the Turbo so its either naked or flaws. I dropped my naked Xtreme Guard Tempered Glass covered Turbo in Walmart yesterday. 4 feet strait to the tile floor. It hit at an angle, facing down and bounced a little bit before settling face down. I was a little anxious when I picked it up, but when I saw the face wasn't shattered, I sighed with relief and put it back in my holster. However. later when we were pulling into the movie theater parking lot, my girlfriend noticed there was a crack on the screen. 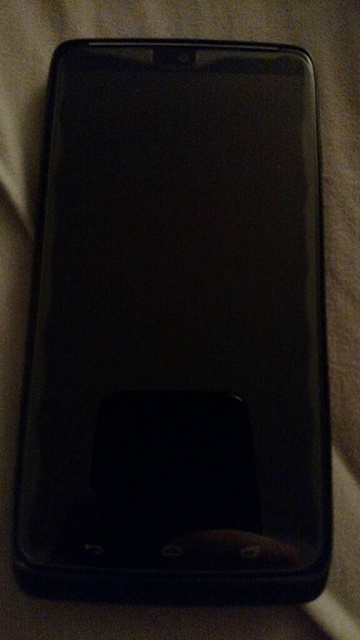 So, upon closer inspection, sure enough, the tempered glass protector has 3 separate edge chips (from the bouncing no doubt), and one crack going diagonally from the lower left corner upward toward the middle of the phone about 1.5 inches long. You can barely feel the crack with your fingernail, and can't feel it with the pad of your finger at all. So, did the Extreme Guard Tempered Glass protector save my screen from cracking, or did it just crack and re-enforce a false sense of security? I don't know. I do know that my experience with the product has been very good (love the feel of it, and the thickness of it). I found another 90% coupon (if you buy 2), and ordered 2 replacements for $12.00 yesterday, no tax and free shipping. Hopefully, I will have the same good luck on installation and fitment as I did on the first one. Well, I continue to be one of the few happy customers with the Extreme Guard Tempered Glass product. I replaced my broken one this morning. Pictures below. 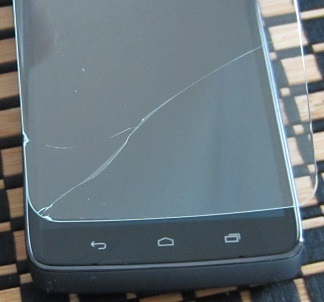 The phone with the damaged screen protector after dropping it 4 feet onto a tile floor with bounces. The gouge and crack are obvious. Did it save my phone screen, or just break the protector; who knows? I'll assume the former for peace of mind. 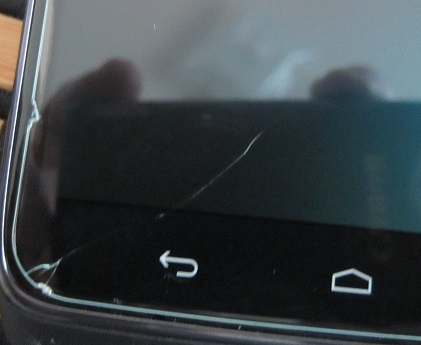 The screen protector after carefully removing it from the phone. I don't now if the protector would have continued to crack or not, but it seemed like the crack was slowly spreading (although I may have been imagining that). The new protector installed. Sorry about the reflection of my fingers in the lower left corner. It's surprisingly difficult to get a good photo of a screen protector without something reflecting in the glass surface. Perfect? Maybe not. Is it worth $60? No. $6 after 90% discount? It is IMO. My iVoler .2mm poped a corner up for no reason the other day.... my wifes is still holding on ok. Wishing i would have left my extreme guard on now. Contact iVoler and see what they can do. Apparently they're now using a better adhesive so this shouldn't happen now. did your phone get damaged? What Should Android Device Manager's Unlock Screen Look Like?